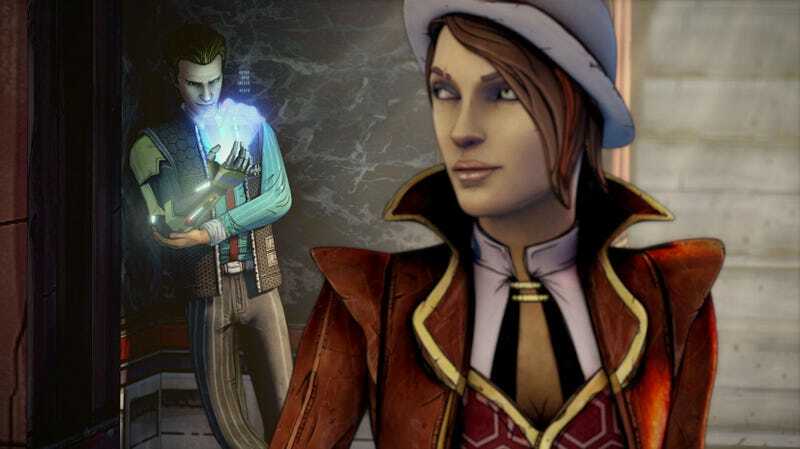 "You never really play what actually happened, you're playing this Big Fish version of what happened," Telltale's Kevin Bruner said of his studio's Borderlands spinoff, Tales from the Borderlands, at a panel at SXSW on Saturday. As reported by Polygon, the game will include a pair of playable protagonists who narrate the events of the game in media res, and the things each of them says happen won't always agree. The con artist Fiona and cybernetically-enhanced Hyperion bro Rhys are strictly in this for themselves, and so they say what they think they need to rather than be straight up. Since the game will take place on Pandora—after the events of the second game—playing as those sorts of people makes sense as Pandora is the spot for greedy folks, including all the playable characters from previous games. There will be comedy, and there will be shooting ("In a Telltale kind of way," Harrison Pink explained), but of course it will be different from Gearbox's games and still follow the formula Telltale has run with in The Walking Dead and The Wolf Among Us to an extent. And Gearbox's Anthony Burch said it's about "schmos trying to get by" rather than any kind of world-saving stuff. Burch then referred to Mos Eisley as a relation—that desert city Luke Skywalker visits in Star Wars is featured in a short story anthology called Tales from Mos Eisley Cantina. "Borderlands can be more than just shooting people in the face repeatedly," Gearbox's Anthony Burch said. "That it could be shooting people in the face repeatedly and then talking to them is a cool possibility for us." There was little to actually see from the game at the panel, however—no trailers, gameplay or much in the way of images—so a lot of this is still hype chatter at this point.